I'm pretty sure I have the best readers ever (I know every blogger feels that way . . . but I really do!) because you left some amazing comments about the yarn ornaments. I really appreciated your honest feedback and suggestions. Since I'm new . . . and slightly inept . . . to planning crafts for a group of 24 five and six year olds, I REALLY need help! As I side note, I realize these crafts don't really need step-by-step explanations and directions, but I give them so that you can read what the process is and give me your feedback about whether you think it's too hard, too easy or just right . . . hey, I sound like Goldilocks! Also, I checked with the teacher and all the kids do celebrate Christmas, so most of these crafts use traditional Christmas symbols. I think Eat It will be a cookies decorating station. So I need a Keep It and a Give It craft. 1) Peel the backing of the foam star sticker. Place at top of tree. Make a zigzag with the glue from the top to the bottom of the tree. And place the yarn over the top of the glue like garland. 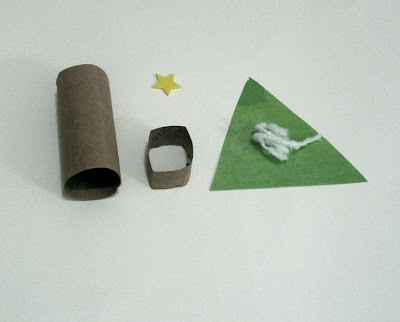 2) Glue the tree onto the paper roll leaving about 1/3 or 1/4 of the paper roll sticking out of the bottom as the tree trunk. 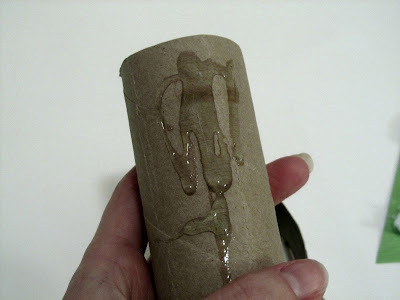 3) Stick the square-shaped paper roll into the bottom of the tube. 4) Fill tube with candy or crayons. I like this audition better than the yarn ornaments, but I'm not completely sold on it. Too easy? Too hard? Weigh in! What do you think? This is really cute, and much more on target than the other one for kindergarteners. I'd think about how much time you want this project to take, as is it will be pretty fast. You might have the children color decorations on the tree, instead of simply gluing on the garland. It will take more time, and allow for more creativity. The only thing about the square part into the bottom of the tube, is that it might be tricky for kindergarteners, but you could easily do that part beforehand. It's a great idea though, and would serve as a great way for them to "give" a gift to someone. You could also have them "wrap" the present to go in the tube to take more time if you need to! I really like this idea as it allows for all skill levels. The first idea would be great if you have a helper who could sit at the table and help each child. 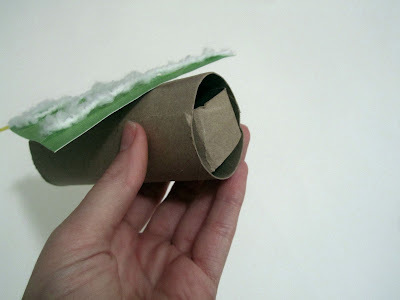 For the centre part at the bottom of the tube you could just cover with brown paper to look like a trunk. I like this one too!! It would be faster - what about getting some of those giant colored sequins and letting the kids glue those on for ornaments? That would add a little time and more personalization options for them. On a seperate note, one year in Sunday School during a "center" type thing like this, we had small stickers (I think they were small address labels) that we'd printed with the kids names - multiple sheets with the whole list of class names on them. So we could give each center a sheet of stickers that had everyone's names on them. This is cute, but as a parent, I always love gifts that will hold up over the years. One of my favorite things to do with little kids is make ornaments! I love those little candy canes that you make by alternating red and clear tri-beads on a pipe cleaner. I have done that with kindergarnters and they are all able to handle that. You can do the same idea and make snowflakes but premaking them a six-pronged snowflake form (ahead of time) and letting them string on different types of clear plastic beads. If you have a Hobby Lobby, they usually have a better selection of these. I also have a weakness for little kid finger prints and handprints, especially done permanently on ceramic. You can get cheap plates at the dollar store or get white tiles at home depot (I just bought some there for $.48) and used the ceramic paint to let them do a handprint or fingerprint art. Shoot me an email though my blog if you want details on any of these! I like this one better!! I think it's easy and fun and the child doesn't need to much supervision! Very cute and very age appropriate! Why can't I work with someone like you on my "Holiday Party" committee?!? It is better, I agree. I love the idea that Valentine Girl suggested. We made candy canes with pipe cleaners and beads years ago, and my mom still has them. The interlocking beads work best. I love this!! I really like it better than the other one. And it is soooooo cute!! The kids could even cut their own triangle. I like the idea of them putting little decorations on it, as someone commented...more personal. Will there be a choice #3? If not, this is definitely the winner! 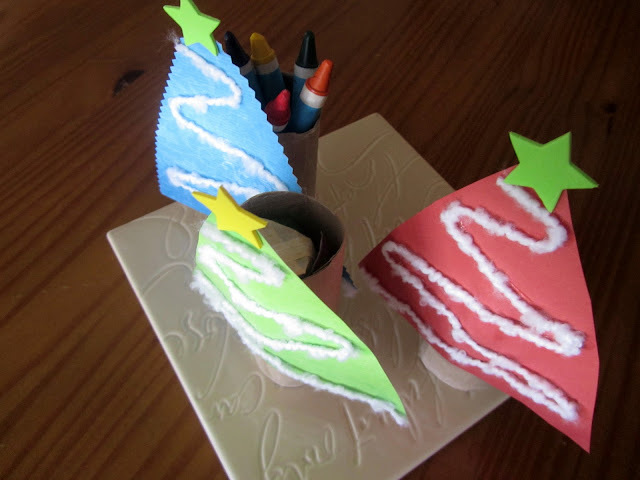 i like this craft and might have to try it with my 3 year old. 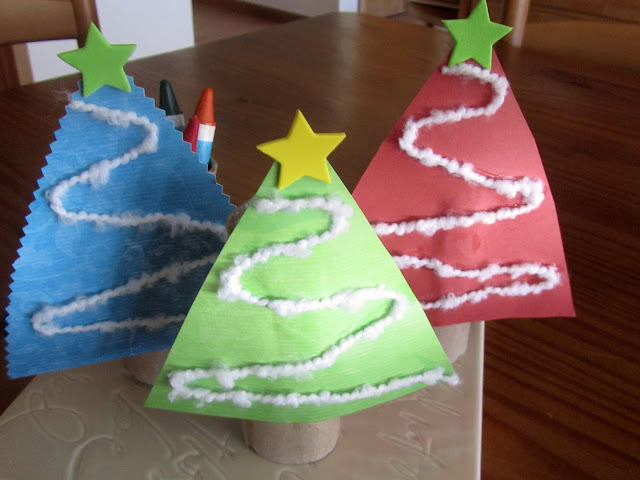 but i agree with some of the other posters that i'd let the kids decorate the trees with crayons or stickers to make them more personalized...they could also put another green triangle on the other side to make it two-sided...that might help keep it balanced better too. This is a great project! Usually, the teacher works with the kids to make something for their parents (that last longer, so I wouldn't worry too much about that. What might be fun about this one is that you could easily fit it into a srapbook one day. Great idea! I forgot to say that I have a very cute tree ornament my son made in preschool using a pre-cut tree made out of green posterboard. Then he just glued on buttons of various sizes and colors all over it (like, it was covered!). So cute, a gold ribbon and it became an instant classic!! LOVE it! PERFECT for kinders! I would maybe have some sequins, stickers,maybe even glue and glitter (if you're brave enough) etc to decorate the tree with a bit more! It would take more time. You could also use white paper and have them color it green. 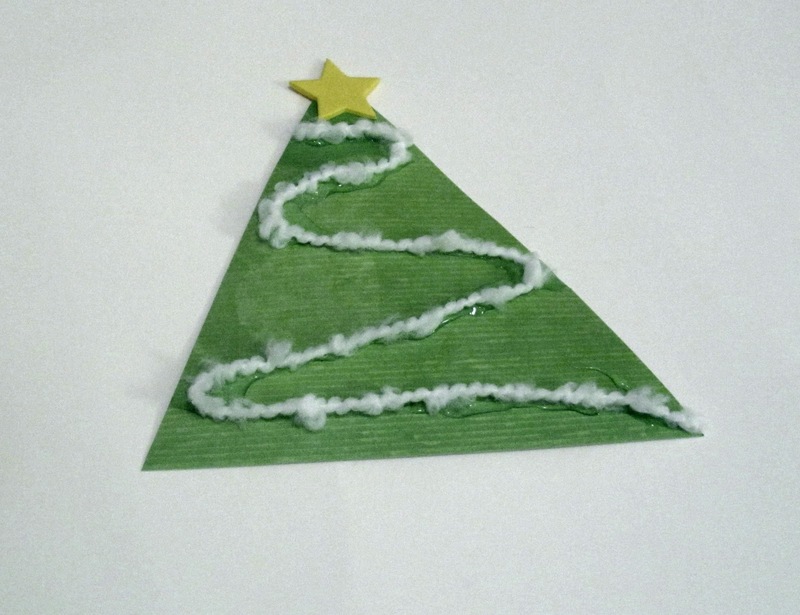 OR...Have triangles photocopied or hand drawn on green paper and let the kids cut it out! Kinders are learning how to cut! You would need several rolls though...so need to collect right away! Those are really cute. It's such an amazing activity for my kids.